See you in Atlanta, Coach? Do you have a ticket? Once again, this is a game that could easily be renamed “Prelude to a National Title.” The SEC championship game is truly a one of a kind. A member of the conference has gone on to win the past seven straight national championships. 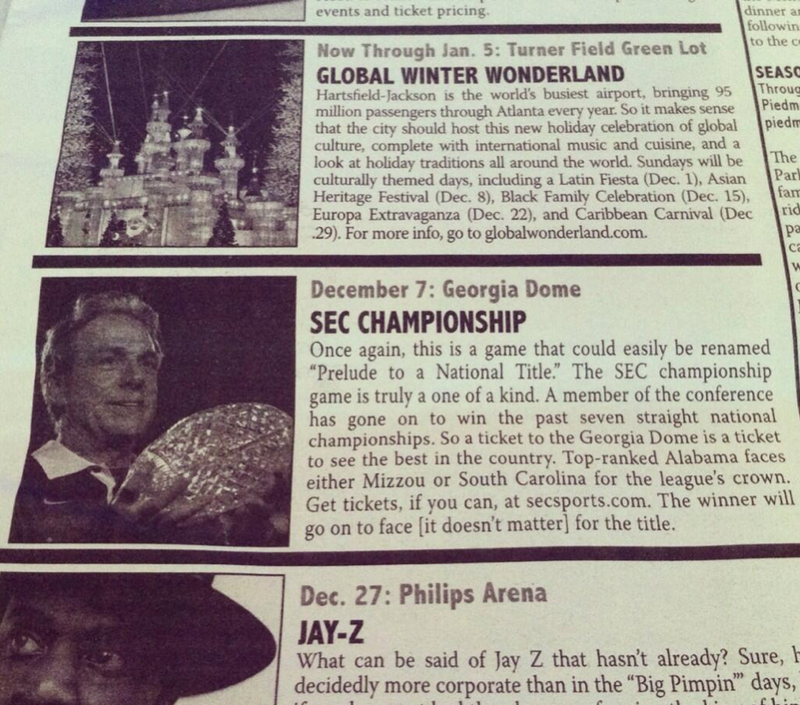 So a ticket to the Georgia Dome is a ticket to see the best in the country. Top-ranked Alabama faces either Mizzou or South Carolina for the league’s crown. Get tickets, if you can, at secsports.com. The winner will go on to face [it doesn’t matter] for the title. It’s also still up on their website. I wonder how many Bama fans will still show up? Related: Gene Chizik is Mr. December in the 2013 Aubie calendar. Get Robert Clay and Josh Snead on line 2. An excellent parody…. Harvey Tider shows up at Atlanta to watch his Tide play, holding his Entertainment listing. Using cut footage from 2010 for AU, and Mizzou footage from their field, you have each team run out onto the field. First Mizzou of course. He can be commenting… “can’t wait for my tide”. Then Auburn runs out. That would be great. Or having the “Bama Tide Radio” announcers mistakenly show up for the game. Either way, much fun to be had.